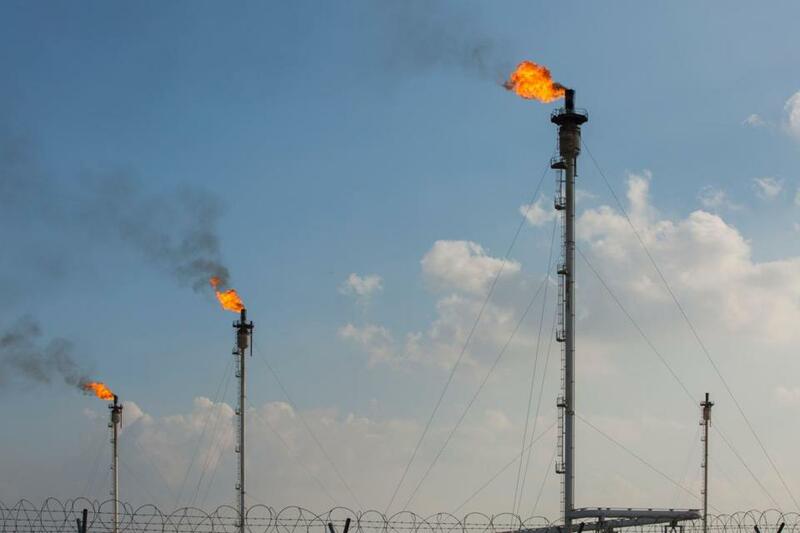 Gas flares at the Basrah Gas Co.’s facilities in Basra, Iraq, on Monday. WASHINGTON — The Trump administration is pressuring Iraq to stop buying energy from its neighbor and sole foreign supplier, Iran, in what has become a major point of conflict between Washington and Baghdad. Iraqi leaders, fearing that a further shortfall in power would lead to mass protests and political instability in their electricity-starved country, are pushing back on the demand, which is rooted in President Trump’s sanctions against Iran. The dispute has frayed US diplomacy with Baghdad as Iraq tries to steady itself after the US military withdrawal in 2011 and the campaign against the Islamic State group. Iraq’s defiance further jeopardizes Trump’s goal of getting all nations to comply with sanctions after withdrawing from the deal to limit Tehran’s nuclear program last year. Already, European nations have set up a legal financial mechanism to do business with Iran, and China and India are resisting US efforts at prodding them to cut off oil purchases. Tensions rose after Trump said Feb. 3 that he planned to have US troops who have returned to Iraq “watch Iran,” despite Baghdad’s need to maintain cordial ties with its fellow Shiite neighbor. Trump’s comments added momentum to proposed legislation in Iraq that would limit the movement and activities of US troops. “The people of Iraq have suffered from the blockade and are aware of the harm done to the people by their actions,” Prime Minister Adel Abdul Mahdi of Iraq said last week after a meeting with the governor of Iran’s central bank, Abdolnaser Hemmati. He was referring to 13 years of crippling sanctions imposed on Iraq by the United States when Saddam Hussein was in power. “Iraq will not be part of the sanctions regime against Iran and any other people,” Abdul Mahdi said. Hemmati said he hoped Iraq and Iran would cooperate more in banking, which could also weaken US sanctions. US officials are seeking to cut off Iraqi purchases of natural gas and electricity, even though the country relies on those for a good portion of its energy needs. Iraq’s energy production and grid capabilities have lagged since the US-led invasion of 2003, and blackouts in cities are common, even with the current purchases. The energy shortfall is especially acute in the sweltering summers, which has led to large protests that become national crises. Iranian natural gas is the single most critical energy import in Iraq, but US officials say purchases must end now because gas falls under the US sanctions. And the Trump administration has told Iraq’s leaders that they have until late March to end electricity purchases, amounting to about 1.2 gigawatts. Officials in Baghdad say there is no easy substitute for either one because it would take three years or more to adequately build up Iraq’s energy infrastructure. The Trump administration’s push on Iraq is part of its strategy of using sanctions to weaken Iran’s economy and prompt political or policy change. Administration officials aim to coerce Iranian leaders to fully dismantle their nuclear and ballistic missile programs and curb their support for Shiite Arab militias in the Middle East. US officials say they want to get Iranian oil exports to zero, but they gave leeway to some countries when imposing sanctions in November. The State Department and Treasury granted waivers to eight countries, including China and India, Iran’s two biggest customers, to allow continued purchases for 180 days. Iraq was given a 45-day waiver on electricity, which was extended by 90 days in December. On Jan. 9, Secretary of State Mike Pompeo spoke to Iraq’s two top leaders in Baghdad about “energy independence,” a State Department spokesman said. Iraqi officials said the US demand acknowledges neither Iraq’s energy needs nor the complex relations between Baghdad and Tehran. The defiance by Iraqi leaders underscores the lack of support among many nations for the sanctions and the US goal of crippling Iran’s government. Analysts say they do not expect China and India to stop their purchases of Iranian oil even after the 180-day waivers expire. On Jan. 31, Britain, France, and Germany announced a mechanism to allow countries to do business with Iran in a way that does not violate sanctions. This week, diplomats from dozens of countries will meet in Warsaw for what US officials originally billed as a discussion of the Iran sanctions and containment strategy. But Western European nations balked at the focus on Iran and threatened to send lower-level officials, forcing the State Department to broaden the theme to addressing instability in the Middle East. Inside Iran, the sanctions have led to a scarcity of medicine, adding to global criticism of the US policy. Last month, top US intelligence officials contradicted Trump by saying Iran was not currently taking steps to make a nuclear bomb. Those officials and the International Atomic Energy Agency say Iran still appears to be complying with the nuclear deal from which Trump withdrew the United States in May. Iraqi officials have also expressed concern over demands from the Trump administration to sign deals with American companies to build up energy infrastructure. Last October, the Trump administration pushed Iraqi officials to sign agreements with General Electric for multibillion-dollar power generation deals, after Siemens A.G., a German company, had been on the verge of landing a $15 billion deal with Baghdad. Iraqi officials ended up signing nonbinding agreements with both companies. Senior US officials had warned al-Abadi, then the prime minister, that signing the deal with Siemens would put Iraq’s relations with the United States at risk, Bloomberg News reported. For a long-term solution, the Trump administration is urging Iraqi officials to connect their grid to Saudi Arabia, Jordan, or Kuwait. They are also pushing Baghdad to sign contracts with foreign companies for natural-gas capture, processing, and transport to use gas that is lost during crude oil production. Iraq has 1.7 billion cubic feet of gas flaring per day across 30 fields. The World Bank has worked with the Oil Ministry for two years to improve legal and regulatory foundations for gas contracts.